I love to experiment in the kitchen and try to concoct things that taste good, rate high in sports nutrition, and help my running performance. Not so long ago I was traveling with my sister and she introduced me to hummus. Ive heard of it for years but never eaten it. Go figure. To begin with, the basis of hummus is chickpeas, or garbanzos if you prefer. I like the term garbanzo because its just more fun to say. Also, the dictionary lists it as a slang term. Go on, use your imagination. Anyway, this legume has a glycemic index rating of just a low 34, meaning that it is very slow burning so its a great choice for long runs or weight loss if youre following the South Beach Diet. And spinach? Its a low, low 15. It also has zero fat and cholesterol and packs a whopping 160% RDA of vitamin A per serving. These are just several reasons its better than lettuce in salads or on a whole wheat BLT. Like I mentioned above, I experiment, so feel free to do so yourself. 8 oz. organic garbanzos, boiled. The bag has 16 oz. so I boiled them all and had half to save for soup. 5 cloves garlic, finely minced. 1 large serrano pepper, finely minced. Ill add another one next time if the kid isnt going to eat it. 1/3 bottle of Kraft Balsamic Vinaigrette salad dressing. Extra virgin olive oil added as you go along for desired consistency. 3/4 of a 10 oz. bag of washed spinach. I had intended to make this as a hummus but ended up calling it a dip because my tired old blender wouldnt properly mash the garbanzos; but if yours will, go for it! Boil the chickpeas (garbanzos) until tender; about 2 hours. Mince the garlic and pepper. Load a large mixing bowl with the chickpeas, garlic, pepper, and salad dressing. Liquefy the spinach in the blender and add it to the mixing bowl. Mash it all together with a potato masher, adding olive oil, until you reach the desired consistency. Consume this concoction with a spoon or chips or crackers of choice. 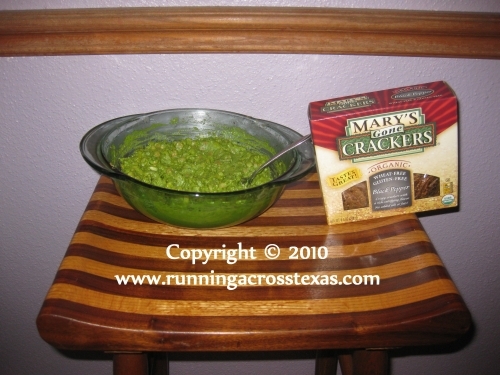 I used Marys Gone Crackers organic brand. My sister also introduced me to this treat. Theyre a bit pricier than conventional Lays chips, but they are much healthier. They are also gluten-free; doesnt make any difference to me but it might to you. There are several alternatives Id like to try in the future. A splash of lemon juice or zest for one. I planted a Meyer Improved Lemon tree last spring so this is yet another use for it. Maybe some dried mustard powder. Ill also try some cilantro for a bit of a Tex-Mex angle. And you can never go wrong with a bit of basil from the garden! Got any modification ideas? Share them with our readers in the comment section below!